Home » Health » What Is Torticolis? The various causes of torticolism can be caused by damage to the neck muscles, upper spine, or even damage to the nervous system. In addition to trauma, such damage may result from infection, spinal cord inflammation, scarring, ligamentous weakness, and tumor. In addition, torticollis can also be passed from parent to child due to gene abnormalities. Babies who are being conceived may be at risk for torticolism if there is a neck abnormality in the uterus. 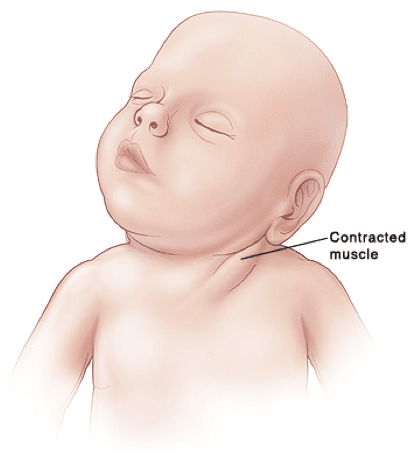 This incorrect neck position can result in damage to the neck muscles or the disruption of blood flow to the neck as the baby grows in the womb. Regardless of the above causes, sometimes torticollis can also occur without a cause. This condition is referred to as idiopathic torticolysis. In addition to looking at the signs that appear in the patient and asking for symptoms that are felt and perform physical examination in patients, a number of examination methods can help doctors in diagnosing torticollis. Such imaging include electromyogram (EMG), neck scanning with X-rays or CT scans, and brain scans with MRI scans. Blood tests can also be performed to look for conditions associated with torticollis. In addition to massaging or compressing the neck with warm water, pain symptoms can be relieved with a number of painkillers, such as NSAIDs (ibuprofen, naproxen, diclofenac), paracetamol, and codeine. To relax a stiff neck, can use diazepam. Administration of botulinum toxin (botox) injections and stretching exercises in the associated muscular areas, especially in chronic cases. Administration of diphenhydramine and benztropine in acute cases. Giving antibiotics to those caused by infection. Operation of the spine in the case of an injury resulting in a dislocated bone. Passive positioning and passive therapy in infants and children. 0 Response to "What Is Torticolis?"